I am a Swing Rhythm Guitarist, in the the tradition of Allan Reuss, Eddie Condon, Freddie Green and Joseph Reinhardt. My rhythm guitar can most recently be heard on "The George Cole Quintette's" "Riverside Drive" record. That CD has recently charted #4 on the CMJ Jazz radio adds chart, and is presently available through many retail outlets as well as iTunes. He has also recorded Bruce Forman. 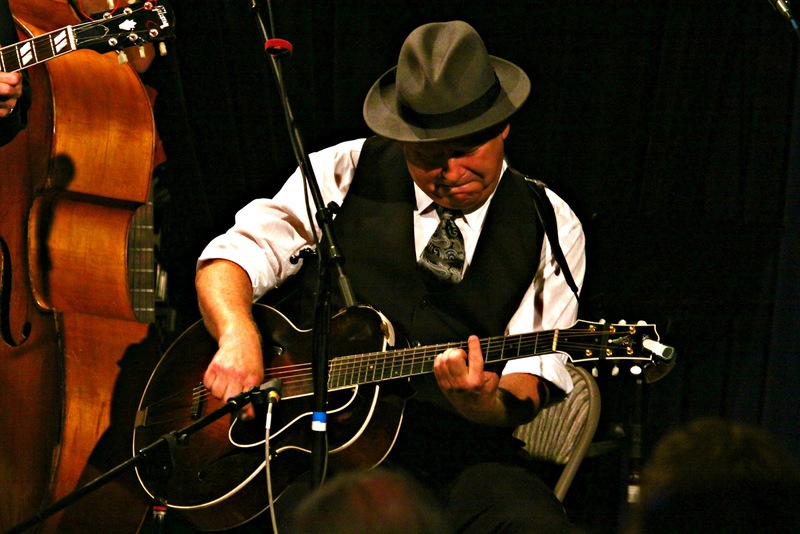 You can see Jack Fields performing with the acoustic swing band, Hot Club Pacific weekly around the Monterey Bay area. Hot Club Pacific features Clarinet Virtuoso Dale Mills, Marc Schwartz on Lead Guitar, and Matt Bohn on Bass. Please visit www.hotclubpacific.com for their schedule. In addition to performing at prestigious events like Djangofest, The Monterey Dixieland Festival and the Tapestry Festival, and organizations like The Grammy's, I've appeared in the feature film, "The Sorcerer," the television documentary "Django Forever," and I've done many live radio broadcasts. I've appeared in "Just Jazz Guitar," magazine. I have also written for "Jazz Me News," the magazine for NPR's weekly "Riverwalk Jazz" radio program. I can can most often be seen playing a Gibson ES-175 and some flavor of Fender amplifier. Am am presently endorsed by Schatten Design , and Savarez Strings . Come out and see my band, Hot Club Pacific, EVERY MONDAY NIGHT, at Soif in Santa Cruz! I can can most often be seen playing a Gibson ES-175 and some flavor of Fender amplifier. In the picture above, I am playing my trusty 1928 L5. I do own a Favino "gypsy swing" style guitar, but for most work I prefer to use the classic Swing and Jazz guitars like the ES-175, L-5 and L-7. I prefer smaller wattage amplifiers. I've been seen using old EH-150 amps and Br-9's. For most small gigs I usually use a highly modified NEW Fender Champ 600, or an old Bronco/Vibrochamp. For larger venues, I'll use something like a Fender Super Reverb, a Princeton Reverb, or even an old Hiwatt Combo.